Several Barnard College Public Safety officers have been placed on leave after a video surfaced showing a student being pinned against a counter for not showing his student ID. Columbia University student Alexander McNab said a public safety officer followed him into Barnard’s Milstein Center around 11:30 p.m. Thursday after he declined to show his student ID at the main gates, reports Columbia Spectator. Students at Columbia and Barnard, which are partner institutions, are required to show their ID after 11 p.m. when prompted. McNab, who is black, said he was aware of the rule mandating students show their IDs but that it is arbitrarily and unequally enforced, noting white students are often not asked to show theirs. The officer called for backup after McNab continued to deny his request to see his ID. A video taken by student Caroline Cutlip and posted to Facebook shows two officers pinning McNab down on a counter. “You have no right to touch me. Take your hands off me. Take your body off me. I did not touch anybody,” McNab can be heard yelling as officers ask him to go outside with them. McNab eventually takes his student ID out of his wallet, claiming the incident is the third time Barnard public safety officers have chased him down. An officer then takes his ID and walks away with it, stating he needs to verify that McNab is an “active” student. McNab then follows the officer but refuses his additional requests to take the situation outside. McNab later said he wanted to stay inside so that witnesses would be able to see the interaction. In a second video, public safety officers said they followed McNab because he ran past a public safety van and across the lawn to the building. McNab and several witnesses said he was walking at a normal pace when officers started to follow him. In the other alleged incidents he referenced in the video, McNab said he was approached by officers when he was on campus for dance practice. He said in the first incident, public safety officers requested his ID as he was leaving the building. The second time, he said he was drinking water from a fountain barefoot when officers wanted to verify he was a student and not a homeless man. Barnard held a listening session Friday night with representatives from Public Safety, the deans of the college, the Furman Counseling Center, and the Office of Title IX and Equity. Columbia held a reflection session Friday evening as well. Barnard President Sian Leah Beilock sent an email to students Sunday night, indicating the officers had been placed on leave and the school would be hiring an independent investigator. The email also said the school would review training for its public safety officers and convene a Community Safety Group. The group, which will consist of students, faculty, staff and outside experts, will conduct a review of Public Safety policies and their equal enforcement and transparency. Additionally, the school is scheduled to hold its first of many inclusive community forums Tuesday evening, according to the email. It will be hosted by the Consortium for Critical Interdisciplinary Studies, in collaboration with Africana Studies, American Studies, and Women, Gender and Sexuality Studies. 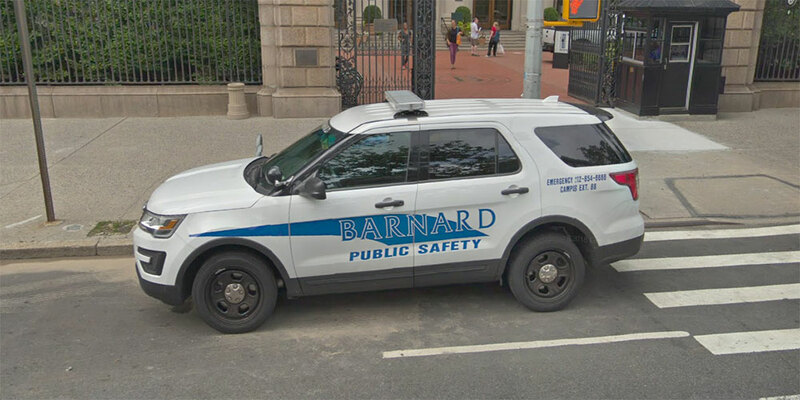 The post VIDEO: Barnard Public Safety Officers on Leave After Student Altercation appeared first on Campus Safety Magazine.